Yeasted Belgian Waffles-mix the batter up the night before and enjoy beautiful, golden waffles in the morning! 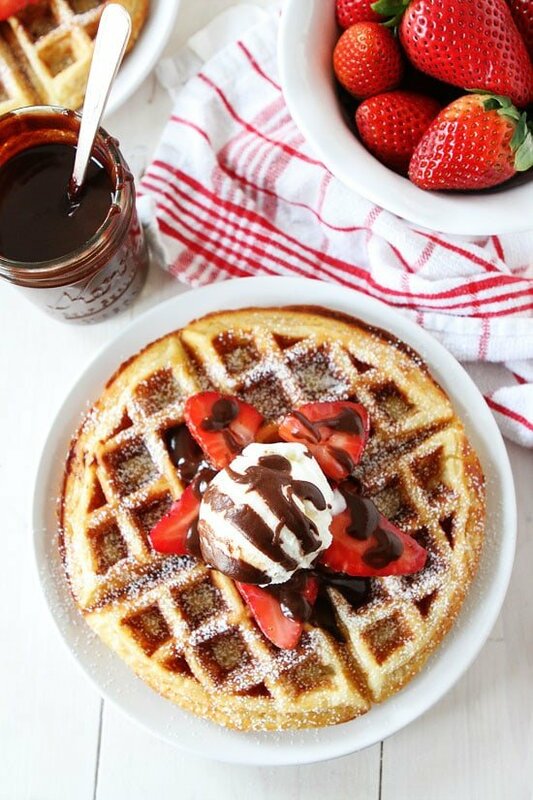 These waffles are also great topped with ice cream and hot fudge sauce for dessert! Valentine’s Day is on Saturday and that means sleeping in, breakfast in bed, and eating chocolates all day. Ha! I wish! For us, it means waking up at 5:30 to take care of the boys. They share a room now and both wake up every single morning at 5:30. They don’t have an alarm clock, they just automatically wake up at 5:30. What is wrong with them? :) I think they had a special meeting in their room and agreed to sabotage our sleep schedules. Breakfast in bed isn’t going to happen for us on Valentine’s Day…unless Caleb decides to bring us yogurt, but I hope breakfast in bed can happen for you! Yeasted Belgian Waffles are the perfect breakfast in bed treat because you make the batter the night before. In the morning, just take the batter out of the fridge and make your waffles! This waffle recipe comes from Ashley’s new cookbook Date Night In. I am SO in love with this book. 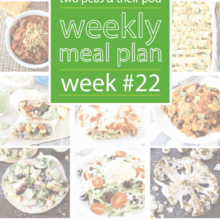 Not only is it super cute, but the recipes are fantastic! And I LOVE the concept. It is just what Josh and I need right now. It is SO hard for us to go out…I can’t even remember the last time we had a real date night. Josh and I spend a lot of time in the kitchen together, but it is usually for work or to feed our family…which is fun, but we rarely take time to really focus on us. Ashley reminds us in Date Night In that you can nourish your relationship and rekindle the romance right in your own kitchen! She shares personal stories about her marriage, family, and ties in the most delicious recipes. You don’t have to leave the house to enjoy a quality date night. It is just important to DO date night, even if it isn’t anything elaborate. Ashley shares more than 120 recipes to make date night delicious…and easy for you! Now, back to the Yeasted Belgian Waffles. They are amazing! The waffles are rich, crispy on the outside, and soft in the middle. The batter needs to be refrigerated overnight, which I love. Whip up the batter before bed and wake up to waffles that are fit for a king! This recipe is super simple! 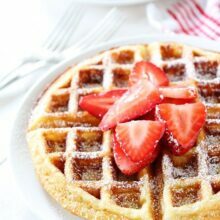 We might not enjoy a romantic breakfast in bed on Valentine’s Day, but we can enjoy Yeasted Belgian Waffles as a family. And because we are making time for date night, I think I will set a couple waffles aside so Josh and I can have a special date night dessert. Ashley recommends serving the waffles with ice cream and hot fudge. Oh yeah! That is my kind of date night! 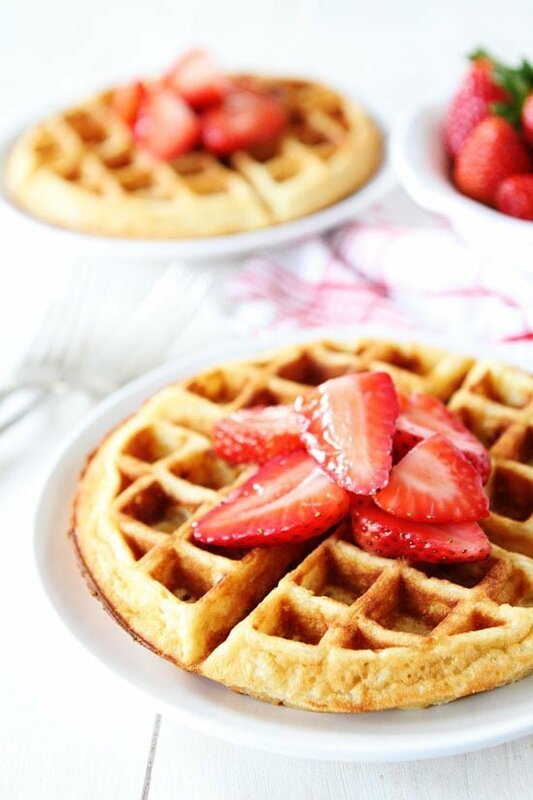 Yeasted Belgian Waffles are great for breakfast or dessert! Share them with your sweetheart and they will taste even better! These waffles are rich, crispy on the outside, and soft in the middle. The batter needs to be refrigerated overnight, which makes waffle making a breeze in the morning. You can also serve the waffles for dessert. Top with ice cream and hot fudge for an amazing treat! In a small saucepan over medium high heat, melt the butter and let cool for 10 minutes. In a medium bowl, whisk together the milk, vanilla, and eggs and then slowly whisk in the melted butter. 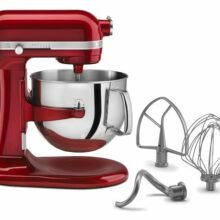 In a large bowl, whisk together the flour, sugar, salt, and yeast. Pour in the wet ingredients. Mix until just combined. Place in a container that leaves room for expansion and cover. Refrigerate overnight or for up to 4 days. If you are rushed, you can make this an hour in advance, but the flavor and texture is greatly improved after a good long rest in the fridge. To serve, remove batter from the fridge when you are ready to use and cook using your favorite waffle iron. Serve the waffles with desired toppings. 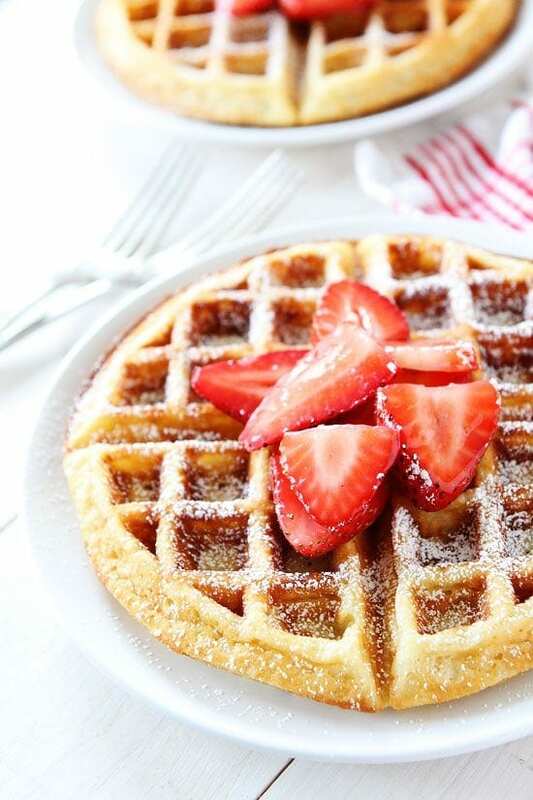 These waffles are great with fruit, syrup, and/or whipped cream for breakfast. They are also good with ice cream and hot fudge sauce for dessert! Enjoy! Note-Waffles can be frozen, well sealed, for up to 1 month. Pop them in the toaster to reheat. You know what they say: I you want breakfast in bed…..sleep in the kitchen. These waffles look beyond spectacular, waffles are so much better than pancakes right in the breakfast wars? Yum. I love your V-day ish toppings. Sometimes date night IN can be so much better than going out! Especially when it involves golden brown waffle goodness in bed! I’ve never done yeasted waffles, but that NEEDS to change! Pinned! 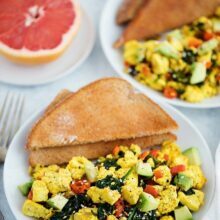 My husband will be out of town on Valentine’s Day, so no breakfast in bed for me either! I’ll get lots of snuggle time with my littlest Valentine’s though, so that’s something. 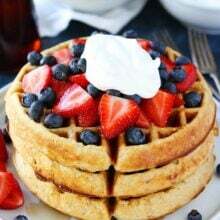 These waffles are going on my list for this week — they look PERFECT!! We looooove waffles, these look fantastic!! I could sure go for some of those for breakfast! Love the drizzling chocolate shot! I love this concept for a cookbook. These waffles would make any day special! Belgian Waffles remind me of Saturday mornings at my grandmother’s house. She’d let us make the batter with her and then choose our toppings (cinnamon-sugar, powdered sugar, strawberries, and whipped topping). I’m all for refrigerating a recipe overnight…it means less work in the morning aka more sleep! I could even see these guys making an appearance as breakfast for dinner on Valentine’s Day. What a fun book concept! Love the look of these waffles!! these are just stunning as far as waffles go!! I just love the idea of this book, I have got to pick up a copy! This looks delicious! Dessert for breakfast, YUM!!! I just borrowed this book and it is a fun read – really sweet essays and nice recipes. I think I need to forward this recipe to my husband so he knows how I want Valentines’ day to start! These look delicious – but am wondering whether they can be made with 2% milk, rather than whole milk, and have the recipe still work. I’m sure it would be fine, not as rich, but still good. there is no such thing as a Belgian Waffle… There are a lot of different waffles in Belgium, none is called Belgian waffle. 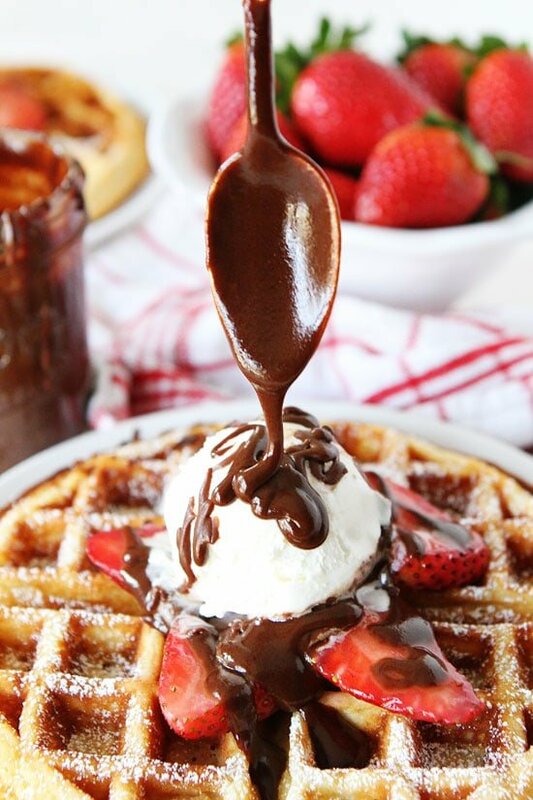 If I didn’t love these waffles enough – you went and drizzled them with that heavenly chocolate! Lovely! Can you send some of these to my hotel room in NYC!?? I am so excited for a yummy breakfast to start out Valentine’s day. These waffles look delicious! Ya think GF all pupose flour would work with the yeast? Thanks and HVD to you! Was this batter supposed to sit in room temp for an hour before refrigeration? I’m used to the King Arthur recipe where you need to let it rise first before putting in the firdge. I made this recipe as is and the waffles turned out flat, a little greasy, and not crispy at all, like it couldn’t rise like it was supposed to . . . ? And it does not look like yours in the picture. So, before I ditch the recipe, I wanted to check and see if there was something missing in the directions. I would love your feedback. Thanks! I didn’t let our batter sit out and our waffles turned out great. Sorry you had issues. I followed the recipe in the cookbook and we loved them! I thought they turned out to be a bit salty… so I’ll definitely be taking it down by about 1/2 tsp next time I make these. They also didn’t turn out to be quite as crispy as I expected… but other than that, they were great! Thanks for the recipe! In my country is really hard to find dry yeast, is possible to change it for another ingredient?